Professor Emeritus, Pacifica Graduate Institute, California, USA. 249 Lambert Road, Carpinteria, California, 93013. 1975 University of de Montréal. Psychology. Ph.D.
2016-1995 Core faculty, Pacifica Graduate Institute, Santa Barbara. 1995- 1976: Department of Communications, State University of Québec, Montréal Campus. Tenured in 1979. 1972 – 1974 Adjunct Professor, University of Montréal. School of Social Services. – – Au Delà de la Honte et de l’Orgueil. Éditions Entrelacs. Paris 2018. 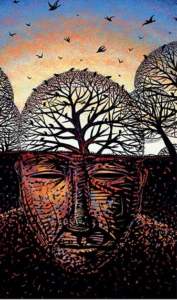 – The Wisdom of the Psyche: Depth Psychology after Neuroscience. Routledge. London and San Francisco. 2016 for the second edition. – Heartbreak, Mourning, Loss, Volume 1: Detach or Die. World Books Collective. 2015. – Heartbreak, Mourning, Loss. Volume 2: The Brain in Love. World Books Collective. 2015. – La Sagesse des Larmes. Editions de l »Homme, Montreal, 2009. – Pagan Grace. Ginette Paris. Spring Publications, Dallas, Texas. 1990. 152 p.
– Pagan Meditations. Ginette Paris, Spring Publications, Dallas, Texas. 1986. – La Renaissance D’Aphrodite. Ginette Paris, Editions Boréal Express, Montréal,1986. – Le Reveil Des Dieux. Ginette Paris, Editions de Mortagne, Montréal, 1980. -A Translation in Italian of Heartbreak, by Moretti & Vitali, Bergamo, 2012. – A Translation in Italian by Patrizia Lorenzi of G. Paris La Renaissance d’Aphrodite. Moretti & Vitali, Bergamo, 1997. – A translation in Portuguese by Sonia Labate of G. Paris Pagan Meditations;: Meditaçoes Pagas: Os Mundos de Afrodite, Artemis e Hestia. Petropolis, 1994. James Hillman Blue Fire: La Beauté de Psyché, éditions du Jour, Montréal 1995. Jung is Passé; Jung is of the future: the Relevance of depth psychology in an age of neuroscience. Public lecture. Monte Verita. Ascona, Switzerland. May 31, 2013. Mourning and Loss: The Originality of a Jungian/archetypal approach. Two day seminar for the Eranos Foundation, Casa Gabriella. Ascona, Switzerland. June 1, 2013. – The Many forms of Loss and the only one way to let go. Sun City Arizona. April 12, 2012. Friday conference and Saturday workshop. -Love and Heartbreak. Friday Lecture and Saturday-Sunday workshop. The Jung Society of Utah. Salt Lake City May 4, 2012. – Love in the city: heartbreak clinic. Pacifica Graduate Institute Public Programs with Institute for Cultural Change. Santa Barbara. September 16 -17-18, 2011. –Alone and heartbroken: where neuroscience meets depth psychology. Paper delivered at the conference « Those Women », Institute for Cultural Change, Santa Barbara, June 2011. — The Next Evolution of Depth Psychology. Conference at the Calgary C.J. Jung Society. Friday, February 25, 2011. – Imagination and medicine: the next evolution of Depth Psychology. A Skype presentation to a Moscow audience on the occasion of the VI Annual conference of Moscow Association for Analytical Psychology. Hosted by The Russian Society for Analytical Psychology. October 14-16, 2011. – Debunking old metaphors and tired fictions. Workshop : the Calgary C.J. Jung Society. Saturday and Sunday, February 26-27, 2011. Depth Psychology after Neuroscience. January 29-31, 2010 Imagination and Medicine Conference. Pacifica Graduate Institute: public Conference. — Beauty, the Birds and the Pope. May 21-23, Ojai 2009. California. International Conference on The Aesthetic Nature of Change. Institute for Cultural Change. — Personal Identity: how can I change my sense of Self ? May 2009. Public Lecture. St-Paul, Minnesota. –Depth psychology and the sense of the Inner Life. September, 2009. Universidad Autónoma de Guadalajara. Mexico. – Myth and Politics. Spring 2008. Pacifica Public Lecture, in collaboration with the Dallas Institute for Humanities and Culture. – The Wisdom of the Psyche. December 2007. The Montreal Jung Society. – Transgression: Unorthodox Therapies.2004 The Atlanta Conference on Mythic Journey. Atlanta. Psychological Art. Texts by Ginette Paris, Images by Pierre Guimond, Mythic Imagination Embodied Soul, Pacifica Graduate Insititute, Lobero Theater Santa Barbara, April 13 – 15, 2000. – Psychological Art. Texts by Ginette Paris, Images by Pierre Guimond, UQAM. The Myth and Theater Festival, Le Petit Théatre of New Orleans, July 1999. – Our Cultural Heritage: Presentation Of The G. Paris CD Rom On Mythology. Victoria Hall, Santa Barbara USA, April 1997. – Le Futur De La Psychologie: La Mythologie,Société Jung de Montréal, Montréal. Novembre 1997. – Psychology As Mythology,The Parker Institute, New Orleans. November, 1997. – The Future Of Psychology: Mythology. The Archetypal Mythology Conference,Pacifica Graduate Institute Public Conferences, Santa Barbara, April, 1997. – The Future Of Psychology: Mythology. The Oregon Friends of Jung Association, Portland, Oregon, February 21, 1997. – Wake Up Or Dream On: Dreams For The World. Pacifica Graduate Institute Public Conferences, Santa Barbara, July, 1996. – Jungian Exploration Of Mythology. Lecture at the Asociacion en Mexico para Etudios en Psicologia Profunda Mexico City, October 20-21, 1995. – Presentation Of The Work In Progress: Mythology: A Cd Rom Of Greek And Roman Mythology. At the international conference ISEA (International Symposium on Electronic Artsheld in Montréal in September, 1995. – Aging. The Writer’s Conference,Sheraton Hotel, Santa Monica, CA, April 8-9, 1995. – Images Of Reconciliation, Dancing Ground Conferences, San Francisco, Mendocino Woodlands, August 1994. – Broken Promises, The London Convivium for Archetypal Studies. VIIIth. Annual International Conference, London , May 27-29 1994. – The Divinities Of Marriage. The Dallas Institute for Humanities and Culture. Dallas, October 1993. – Le Mythe d’Aphrodite. Keynote address for the Festival Mythe et Théâtre,organisé par Panthéâtre, at la Chartreuse de Villeneuve les Avignon, France, Août 1993. – Pagan Epiphanies. Festival of Archetypal Psychology. At the University of Notre Dame, Indianna, USA. July 1992. – Life-Styles Of The Gods And Goddesses. The London Convivium for Archetypal Studies, Cumberland Lodge, Windsor Great Park, Berkshire. June 8-10, 1990. – The Lust Of The Gods. Institute for the Study of the Imagination. West Stockbridge, Mass. USA. March 18, 1990. – Meet The Author: Ginette Paris, On Pagan Grace. The Institute of Depth Psychology of Wainwright House, New York. March 19, 1990. – Le Masque De Dionysos. Conference organized by the Cercle Jung de Montréal, May 13,1988, UQAM. Published in the Cahiers du Cercle. – Mask, Role, And Play: Dionysus In Everyday Life. Paper given at the Educational Center of Pittsburg, USA, April 29, 1988. – Theatre Et Therapie. Paper given August 10, 1987, in Malérargues, France, as part of a conference titled: Mythe et théâtre. This week-long conference was organized by the Roy Hart Theater. – Visions Du Psychodrame. Paper given August 14, 1987, in Malérargues, France, dans le cadre d’un colloque intitulé: Mythe et théâtre. This week-long conference was organized by the Roy Hart Theater of London. – Le Re-Enchantement De La Medecine. Paper in the colloquium: La Santé des Ainés. Organized by l’Alliance Culturelle. November 6, 1986. – Les Enseignements D’aphrodite. Paper given at Laval University, organized by the Cercle Jung de Québec. February 14, 1986. – Rigour And Imagination. Paper given at the Symposium on Ecology, Culture and Imagination. Burlington, Vermont, USA, November, 1985. – Les Enseignements D’aphrodite. Paper given at the Cercle Jung de Montréal and published in the Cahiers du Cercle. Montreal, May 1985. – Femmes Et Deesses. Paper at the ICRAF colloquium. Published by the cahiers de l’Institut Canadien pour l’Avancement de la Femme. UQAM, 1984. – Communication et Symbole. Conference at the Theâtre expérimental des Femmes. Montréal 1981. – Depth Psychology as an Ecopsychology: A conversation between Ginette Paris and Lori Pye. Ecopsychology Journal. Maryann Leibert, publisher . –Redemption:Encyclopedia of Religion. October 2009. Springer Science Media. LLC, New York USA. – Mythology of Marriage. In: Meditations in the Field: a Depth Psychology Reader. Ed. Dennis Slattery and Lionel Corbett, 2000. – Broken Promises. In: Spring: A journal of Archetype and Culture. Spring Publications, Woodstock, Connecticut, Vol. 64. on Histories, Fall and Winter 1998. – A Conversation Between Ginette Paris & James Hillman on Ecology. In: The Salt Journal. Vol. 1. June/July 1998. – A Conversation Between Ginette Paris & James Hillman on Rituals. In: The Salt Journal. Vol. 1. April/May 1998. – Everyday epiphanies. In: On the Sublime. Petruska Clarkson, ed. London, UK, 1997. – If You Invite the Gods to your Marriage. In: Spring: A Journal of Archetype and Culture. Spring Publications, Woodstock, Connecticut, Vol. 60. on Marriages, Fall 1996. – Psychotherapy at the End of the Twentieth Century. In: Sphynx: A Journal for Archetypal Psychology and the Arts. Vol. 7 London, 1996. – Everyday Epiphanies. Sphynx: A Journal for Archetypal Psychology and the Arts. Vol. 4 London, 1991. – Dionysos: Theater and Therapy. In: Sphynx: A Journal for Archetypal Psychology and the Arts. Vol.1. London, 1989. – La Dépression Collective. In: Le Syndrôme Post-référendaire. In: Editions Québec-Amérique. 1989. – Aphrodite souffre-t-elle pour être Belle? In: Souffrir pour être Belle. Editions Fides, for the Musée de la Civilisation de Québec. Dec. 1988. – La contribution de James Hillman? In: La Petite Revue de Philosophie. Numéro spécial: Autour de James Hillman. Published by le Collège Edouard-Montpetit, printemps 1988. Vol 9, numéro 2. – Psychologie Sociale et Psychologie Archétypale. In: Aspect du Sacré, Formes de l’Imaginaire. Edité par Guy Ménard. Cahiers du FRISQ, Montréal 1988, pp. 83 to 86. – Le Masque de Dionysos. In: Publication in the Cahiers du Cercle Jung de Montréal of a paper given at the UQAM May 13, 1988. – Le Caducée. In: Les cahiers de l’Agora. Numéro 1, pp. 17 to 23. Editions de l’Agora inc., Autumn 1987. – Eco-Théologie In: Religion et culture au Québec: Figures contemporaines du sacré. Edited by Yvon Desrosiers. Editions Fidès. Montréal,1986. – Polythéisme et féminisme. Canadian Woman Studies-Les Cahiers de la Femme. Toronto, Canada, Winter 1986. – La psychologie archétypale In: Les Outils de l’Espoir. Edited by Marquita Riel et Luc Morisette. Presses de l’Université du Québec à Montréal, 1985. – Psychological Art. 1999 East Aurora Seminar Program. The Roycroft Inn, East Aurora, New York. July 27, 1999. – Confronting The Unexpected. Commencement address: Pacifica Graduate Institute, May 28, 1999. – IntroducingJames Hillman, Victoria Hall, Santa Barbara, March, 1996. – Panel discussion on Medeaby Euripides, adapted by Alistair Elliot, Ensemble Threatre Company of Santa Barbara, February 8, 1996. – Editing the Script of our Lives, Workshop for The Oregon Friends of Jung Association, Portland, OR, February 22, 1997. – Review Of: The Soul’s Code By James Hillman, (Random House New York 1996). For: Mythosphere: A journal of Mythology. Edited by Professor William Doty, Alabama University, Vol. 1. – Ethique Feministe. Présentation au séminaire organisé par Evelyne Tardif du Centre de Recherches Féministes, le 6 mai 1988, à l’UQAM. – Feminism And Archetypal Psychology. Presentation at the Educational Center of Pittsburg, PA, April 30, 1988. – L’avortement: Aspects Symboliques Et Psychologiques. Communication à la Journée de formation sur l’avortement destinée aux médecins et infirmières des CLSC. Holiday Inn. Montréal le 15 avril 1988. – What Are Archetypes? Panel organized by the C.G. Jung Society of Montréal, with David Miller (Syracuse University), Naomi Goldenberg (Université d’Ottawa), and Ginette Paris (UQAM). Université Concordia, Montréal. March 13, 1987. – Monotheisme Et Polytheisme. Présentation au séminaire interdisciplinaire du FRISQ (Forum de Recherches sur l’Imaginaire et la Socialité Québécoise) tenu à l’UQAM, Le 28 novembre 1986 et publié dans les cahiers du FRISQ. – Social Psychology: From Math To Myth. C.G. Jung and Humanities. Hofstra University, New-York, November 20, 21, 22 1986. – Angoisse Culturelle Et Angoisse Personnelle. Présentation au Symposium sur l’Angoisse,organisé par le Cercle Jung de Montréal les 3 et 4 octobre 1986. Salle Alfred Laliberté de l’UQAM. – Jung Et Societé. Adresse prononcée à l’occasion du 10eanniversaire du Cercle Jung de Montréal, Mai 1985. – Participation à un panel avec Panel avec Guy Corneau et Jeanne Bauer, sur l’oeuvre de J.Hillman. UQAM, Salle Marie Gérin Lajoie. Sept. 1984. – Pour Une Lecture Mythique Des Organisations. ColloquePsychosociologie et Intervention. Montréal, UQAM 1982. –-NPR (UTAH) 30 minutes radio Interview on Heartbreak. May 3, 2012. – Matters of The Heart. Filmed interview for the British Broadcasting Corporation produced by Mark Kiddell. London. 1990. – The Sacrament of Abortion: A conversation between Ginette Paris and James Hillman about abortion. Audiocassette published by Spring Audio. New-York. 1991. – Entrevue accordée à la revue: Guide Ressources publiée sour le titre:Mythologies du temps Fou. p. 47 à 51, Mai-Juin 1988, vol. 3 no 4. – Trois fois passera et le Mythe restera. Revue de théâtre: JEU Mai 1982, p. 85 à 100. – Entrevue à la Radio de Radio-Canada, sur le thème: La fin des Morales.30 minutes 1985.